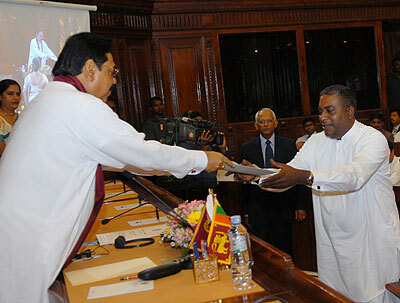 The newly elected members of the Southern Provincial Council took their oaths before President Mahinda Rajapaksa in a ceremony held at the Presidential Secretariat this morning on 29th October. 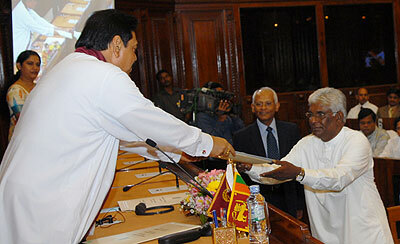 Former Chief Minister of the Province, Shan Wijayalal De Silva was sworn in once again as the Chief Minister. He is also functioning as the Minister of Finance and Planning, Justice and Law, Transport, Drainage and Water Supply, Power, Engineering Services, Health, Indigenous Medicine, and Local Government. 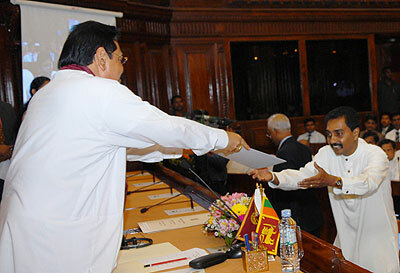 Meanwhile other Provincial Ministerial portfolios have been assigned to several other following contestants those who contested under UPFA banner. 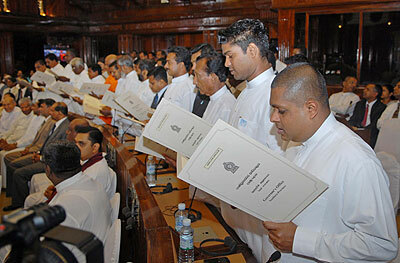 Mr Hemal Gunasekara as Minister of Southern Province - Land, Land Development, Irrigation, Highways, Mass Media, Rural Infrastructure, Mr. V. K. Indika as Minister of Southern province Education, Cultural Trade and Development Co-operative Development, Mr. Dayawansa Ariyathilake Gamage as Minister of Southern Province Sports, Youth Affairs Rural industry, Tourism, Housing and Construction and Mr. Bindu Weerasinghe as Minister of Southern Province Agriculture, Livestock and Livestock Development, Fisheries and Environment. 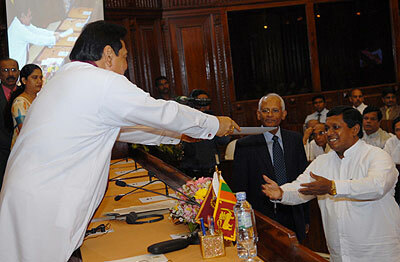 Mr Shan Wijayalal, lawyer by profession who won majority of votes in the recently held Southern Provincial Council Elections, assumed duties first as the Chief Minister of Southern Province in 2004. 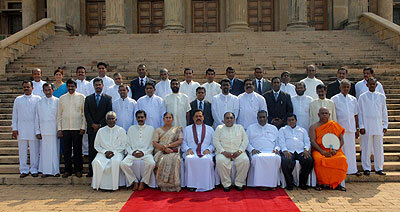 President Rajapaksa addressed the ceremony and said that all must respect the verdict given at the recent election and all must get together to serve the people disregarding all differences. Any person who is not satisfied with the verdict could go to the courts. The President reiterated that there is a possibility of providing a part of the expenses needed for taking up such legal actions.